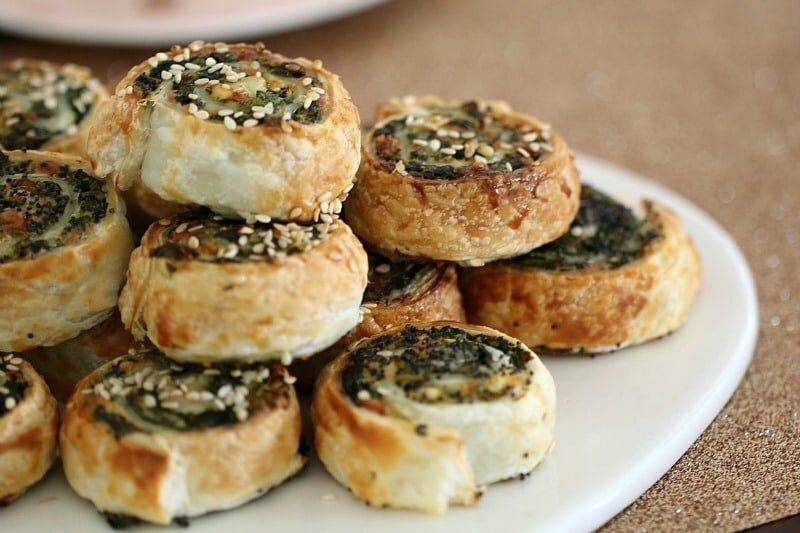 Spinach & feta pinwheels really are just the best little things. They’re incredibly easy to make (especially when you use store-bought puff pastry) and boy oh boy, they taste good. Like really, really good. 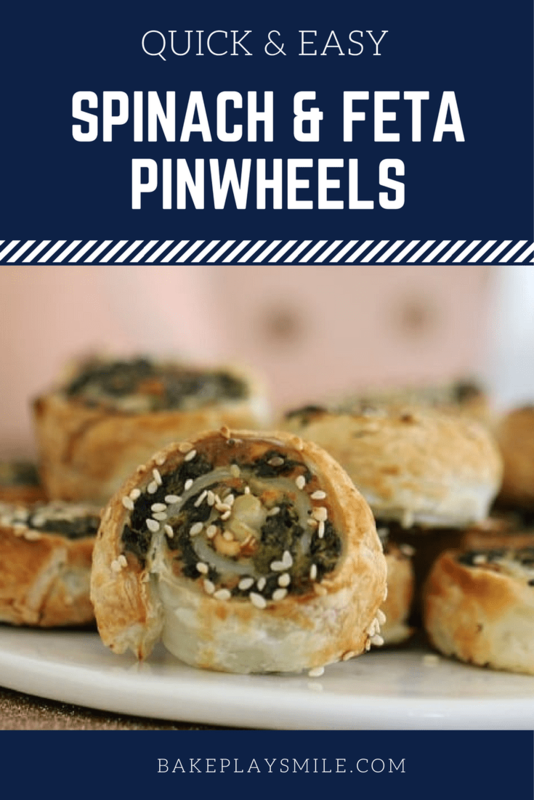 This version of my Spinach & Feta Pinwheels takes 15 minutes to make and about 15 minutes to cook. That means that you can be eating the yummiest little savoury bites in no time at all. 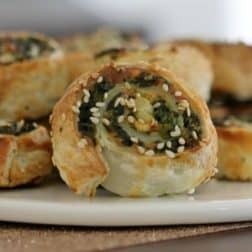 To make sure your pinwheels stay super crispy, it’s really important to strain all of the liquid out of the defrosted spinach. You’ll be amazed at how much liquid comes out! 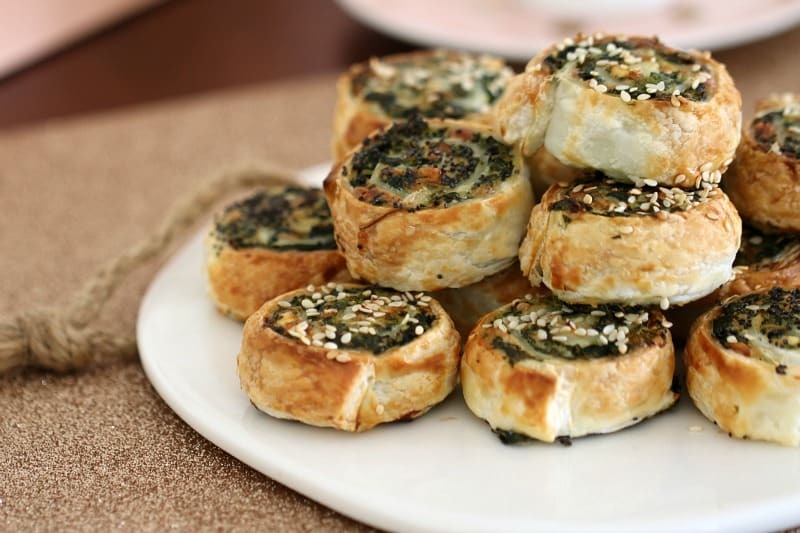 The drier you can get the spinach – the crispier your pinwheels will be. And when it comes to pinwheels, crispy wins every single time. I like to use a combination of feta and parmesan cheese because you get the most delicious flavour. You could of course just use one type of cheese, or even cheddar cheese, but this combination really is my fave. 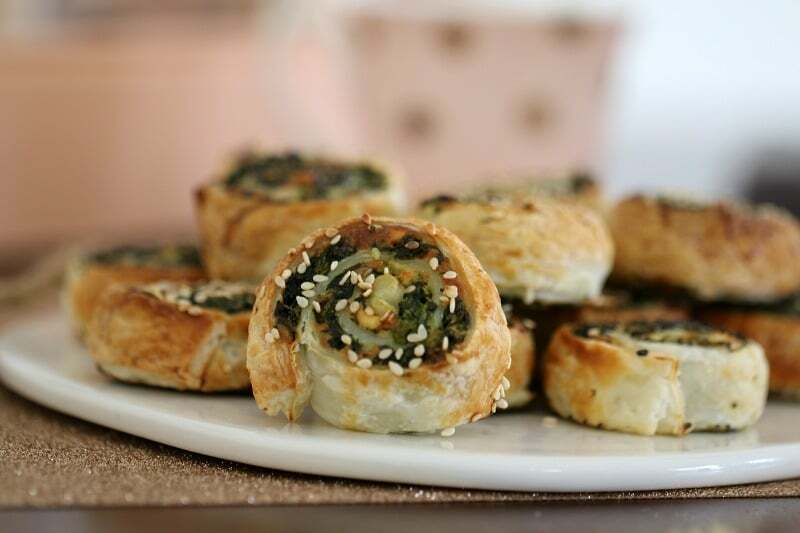 Before baking the spinach & feta pinwheels, brush over a little bit of lightly whisked egg and sprinkle with sesame seeds or poppy seeds. The seeds are completely optional, but I just think it makes them look pretty. And that’s totally important, right!? You can eat these straight out of the oven (OMG soooo good! ), or let them cool completely and pop them into an airtight container. 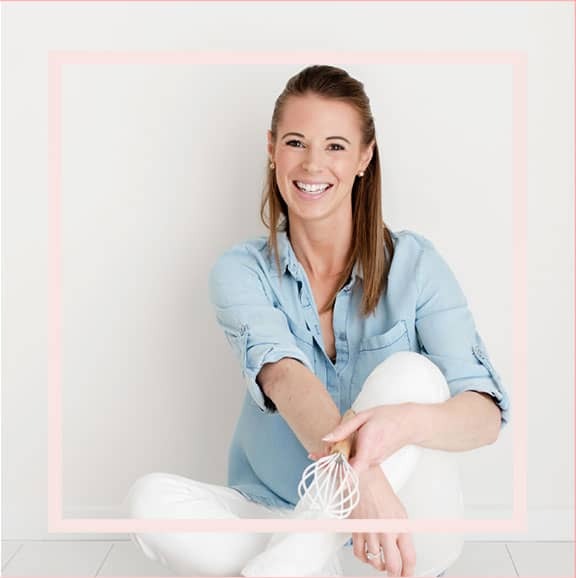 You can also freeze them for up to 3 months – which is fab, because it means you have a handy little snack whenever you need it! If you’re after something a little different, make sure you check out my ham and cheese scrolls and my cheesymite scrolls. Delish! Preheat oven to 220 degrees celsius (200 if using fan-forced). Line two trays with baking paper and set aside. Place the defrosted spinach into a sieve and strain out any remaining liquid. Use paper towel to remove any remaining moisture from the spinach. Place the spinach, feta and parmesan cheese into a bowl and mix to combine. Spread the mixture evenly over the defrosted pastry sheets. Use a sharp knife to cut the pastry rolls into 12 slices. Lay the slices (cut side up) onto the baking trays). Brush with the lightly whisked egg and sprinkle over the sesame seeds or poppy seeds. Bake for 15 minutes or until lightly golden and crispy. 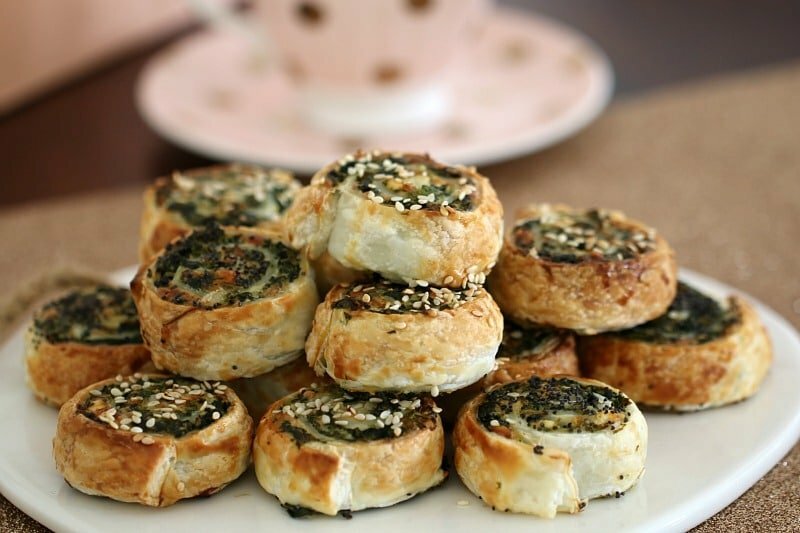 The easiest and crispiest puff pastry Thermomix Spinach & Feta Pinwheels! These make the perfect party food or super simple lunchbox fillers. Place the spinach, feta and parmesan cheese into the TM bowl. Mix on Speed 4, 20 seconds or until completely combined (use the spatula to assist). 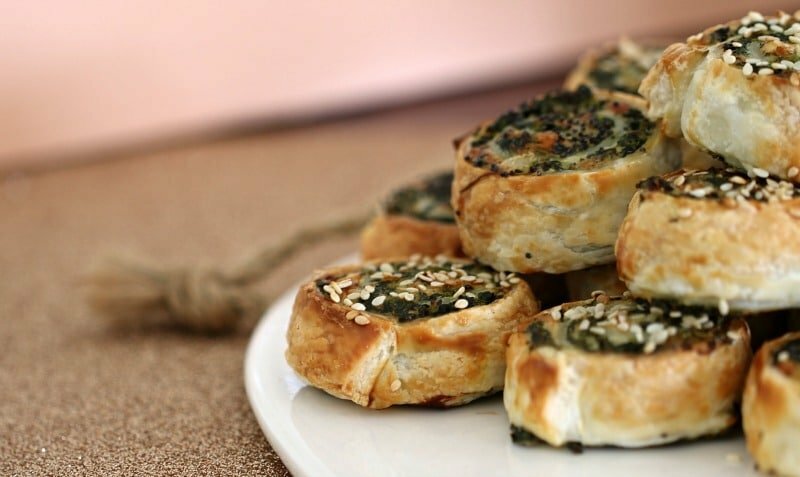 Spinach and Feta are a match made in foodie heaven, don’t you think? I love these pinwheels they just look so pretty! These look so pretty, Lucy! Spinach and feta is a winner every single time. Such a good combination! I can imagine these would be sooo good straight out of the oven. Get in my belly now!! Oh I bet they look amazing!